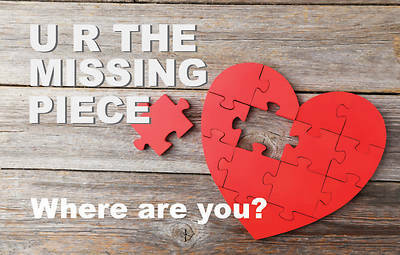 This absentee postcard is a picture of a puzzle heart, with a piece missing from the middle..Text: U R the missing piece. Where are you? This 5 1/2" x 3 1/2" sized postcard is a 4-color design. The shrink-wrapped package holds 25 identical postcards. Pre-Order This Title Order now, item will be available on 8/1/2019.